America started as a place for people to come to escape persecution. From the Pilgrims to refugees from war stricken countries, there have been many groups of people who have sought safety in America for hundreds of years. The idea behind coming to America is to achieve the dream of overcoming adversity. When immigrants come to America, they want the American dream. As difficult as it is to obtain, it’s not impossible, especially in comparison to the country of origin. America represents being able to make a difference in your life by climbing your way up with an education, intelligence, and a motivation to be the best in a certain field. There are so many different stories about people from other countries coming to America to do great things. From business owners to politicians, America signifies that it doesn’t matter where you start, but the path on which you’re going and where you will inevitably end up. By gaining a fresh start as an immigrant, you’re able to go after what you want and obtain it if you work hard enough. If you’d like to go into business or to own a company in the United States, then there are visas to help you obtain your dreams. With a range of visas to apply for, it’s important that you supply information for the correct one, so you’re able to achieve your dreams. With our abundance of immigration information, we’re able to help you figure out the best strategy for you to come to America and work, live, or just visit. In today’s blog, we’ll be going over visas that are based on business immigration. There are several visas centered around coming to America to work in a business. Applying for a business immigration visa comes down to what exactly you want to do for work in the United States. We have supplied immigration information on H-1B, EB-5, and E-2. However, there are other business immigration visas you can apply for. 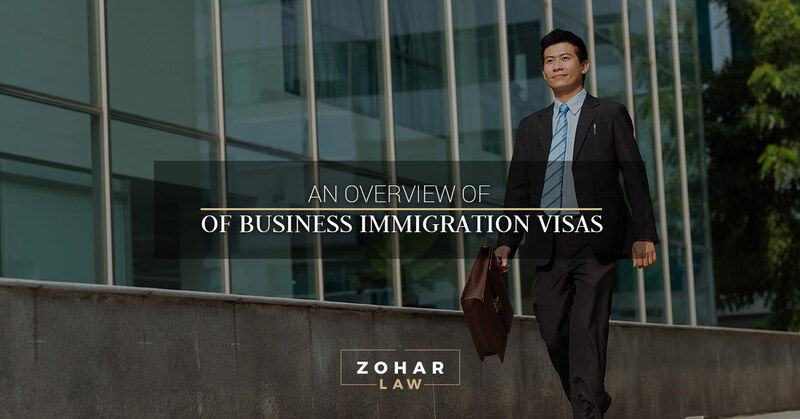 At Zohar Law PLLC, we can help you obtain business immigration visas. In addition, if you’re interested in becoming a citizen of the United States, then take the time to come in for a consultation. If you want to come to America to work as a foreign worker who has a specialty in the workforce, then you should apply for the H-1B visas. If you have a degree in higher education such as a Bachelor’s or a Masters and you want to come to work for a company in the United States, then this is the best visa you can apply for. As a foreigner, this visa will allow you to work in a specific field that you specialize in. For example, if you’re a scientist, computer programmer, architect, engineer, or you specialize in another field that’s very specific, then you’re able to apply for this visa. However, keep in mind under the new administration it can be much more difficult to come into the United States even if you have a Bachelor’s degree and you specialize in a certain field. This type of visa is easier to apply for than a green card and many companies will expedite the process because they want your skill set to enhance the company. The EB-5 is a type of business immigration visa that is beneficial for those who are entrepreneurs. These visas focus on helping entrepreneurs from different countries who want to apply for a green card with their family. The entrepreneur needs to invest in a company in the United States and create or save 10 full-time permanent jobs for American workers. Essentially, in exchange for investing and saving jobs for Americans, you’re getting a green card for you and your family. The investment amount for this type of business immigration visa needs to be at least $500,000 to $1 million to help the company achieve the requirements. This visa is an immigrant visa, which when you follow all of the criteria will allow you to stay in the country for a lengthy amount of time. However, if you don’t abide by the EB-5 standards, then the visa expires after two years. Essentially, this is a conditional green card due to the business basis of it. If you want to obtain this visa, then you have to invest in a for-profit company in America where you can demonstrate that you’re able to supply 10 jobs for workers. The E-2 Visa is a non-immigrant visa. This means that you’re only able to stay in the country for a short amount of time. This type of business immigration visa allows people to do business with a country that’s in a treaty with the United States. This means that if you’re a foreigner from one of the eligible countries that can do business with the United States and you’re investing in the business, then you can come on this visa for a short amount of time. For example, if you’re someone from Canada and you invest in an American company, then you can apply for the E-2 visa. This type of visa is not a green card, but a treaty investor visa that allows you to come here temporarily to do business. Unlike the EB-5, this one doesn’t require a large sum of money to invest in a company, so you can come to America. Key components of this treaty visa include expiring after five years, there’s an unlimited amount of extensions, and your family can come with you to stay for up to two years. Business immigration visas can be a tricky area to navigate. With our immigration information, we’ll be able to guide you to figure out the best strategy for you and your family. These three visas are some of the main business immigration visas you can obtain. For further information on any of these or to enquire about more opportunities when it comes to business immigration visas, contact us by filling out the form below.